This rice is crossbreed「Hosiaoba」and「Yumegokochi」. Breeding needs 10 Years. 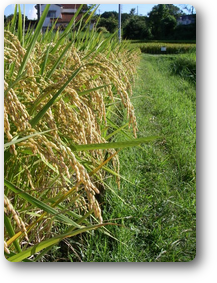 Otsubudaiya has large grains of rice, good taste and high productivity. There are many inquiries from farmers. 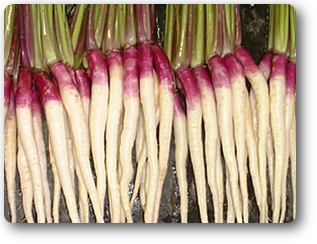 Hinona turnip is traditional vegetable in Shiga prefecture. The upper part of the root is red, the bottom is white.We launched F1Ujisato in 2004 that has three features. bottom is beautiful pure white color. 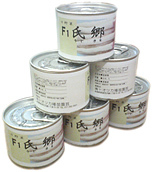 ※This product confirms to Japan Agricultual Standards. Yuuki Ouji is made from pure animal matter. Abundantly contain kinds of amino acid, minerals, organic phosphoric acid. Yuuki Ouji improves the soil. Continuous using this fertilizer make microbe's breeding strong. Raise soil's breathes,moisture retailing property and permeability, prevent replant failure and make productive soil. Yuuki Ouji is useful for improve quolities and increase in yield.